CAMBRIDGE, Mass. - The father of a measurement known as the "Smoot" returned Saturday to be honored at the Massachusetts Institute of Technology, the school where he and his fraternity brothers invented it 50 years ago. Oliver Smoot was the shortest pledge in the Lambda Chi Alpha fraternity in 1958 when its members decided to lay him on the Massachusetts Avenue Bridge. 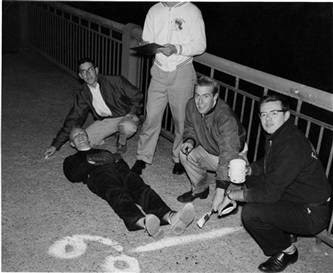 After discovering Smoot measured 5 feet 7, they marked the bridge in those increments, with an eventually exhausted Smoot getting up and down for each new measurement. They soon determined the bridge was 364.4 Smoots long. MIT student Oliver Smoot is shown lying on the ground of the Massachusetts Avenue Bridge in Cambridge, Mass., in this undated photo. The original Smoot, who later became chairman of the American National Standards Institute, spoke Saturday at "Smoot Celebration Day" at MIT and received a plaque. The plaque will be installed on the bridge this year. Smoot said the freshmen who repaint the Smoot markers on the Massachusetts Avenue Bridge every year may not appreciate how good they have it. "For years, the police departments of Boston and Cambridge took this as an infraction and would chase the guys repainting the marks — but they called a truce," Smoot said. "I'm not sure if they tell the freshmen that at least you won't get hauled into jail." Thanks to JMJ for sending this to me!